Keiko Matsudo Orrall, the new executive director of the Massachusetts Office of Travel and Tourism. RAW Catering served up some east-coast oysters. MacPherson and, with the flamingo-embellished tie, Ginisi. 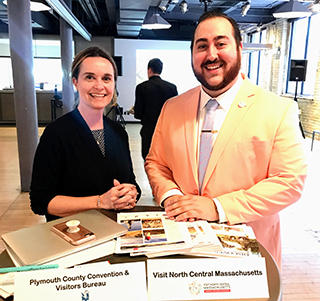 David Ginisi looked quite bold with a pink flamingo-emblazoned tie at a Massachusetts Travel & Tourism Networking Night on 9APR. But it wasn’t a fashion statement – it was a nod to a historical memento of his home state Massachusetts. That’s right, you might have associated the tacky plastic pink lawn flamingo with Florida, but the bird actually made its debut in MA, says Ginisi, the Marketing & Communications Manager for Visit North Central Massachusetts. 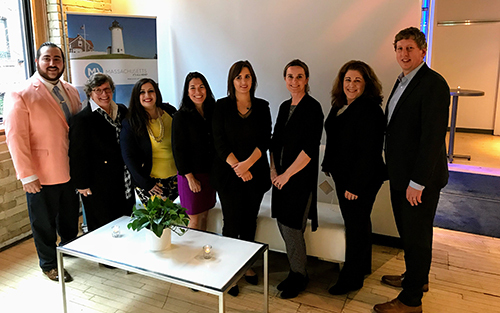 Ginisi was in Toronto, along with four other destination representatives, to introduce Massachusetts to media and agents. “If there’s one thing I want you to remember about North Central Massachusetts, it’s that we are the Napa Valley of apples,” says Ginisi, noting that the region – home of Johnny Appleseed -- is a haven for apple lovers – there’s apple ciders (both hard and soft) and apple cider donuts for the tasting, beautiful orchards for strolling and other apple-themed products to experience. Over in Western Massachusetts, known as the artistic hub of the state, visual and performing arts aficionados will get a kick out of the abundant theatres, museums, galleries and concert halls. 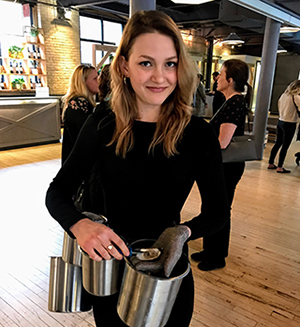 “It’s a chance to see some of the top talents in the industry, but on a smaller scale, a smaller calibre,” says Victoria Saltzman, Director of Communications for the Sterling and Francine Clark Art Institute, located in Williamstown in the Berkshires. The arts scene is so acclaimed here, that Saltzman says even the likes of Bradley Cooper and Uma Thurman have performed in theatres in the area. The Clark Institute has the largest private collection of French Impressionist painter Pierre-Auguste Renoir paintings, who passed away 100 years ago in 1919. It’s an interesting story of how such a great collection of Renoir paintings ended up in Williamstown, of all places – a town of 4,000 people with a single stoplight. Saltzman explains that the institute’s founder Sterling Clark -- (interestingly, he was also heir to the Singer sewing machine) -- was an avid art collector, accumulating numerous Renoirs, as well as dozens of pieces of art and sculpture by other Impressionist artists. He and his wife, Francine Clary, initially considered housing their collection in New York but with the tensions between the U.S. and Soviet Union in the 1950s, he wanted to have a safer, more remote location for his prized possessions, and settled on Western MA. Throughout North of Boston and South of Boston, quaint lighthouses dot the shore among quaint towns and historical hotspots, each with their own distinct flavour. In the north, you can visit historical towns like Salem, location of the famous witch trials in the late 1600s, or Gloucester, a vibrant coastal city perfect for discovering maritime culture. North of Boston is also a place where many movies were filmed, like Martin Scorsese’s 2010 thriller Shutter Island, and the drama/thriller starring George Clooney, The Perfect Storm, released in 2000. Taking a step away from the laid-back countryside of Massachusetts and into the bustle of its capital, Boston is ever-expanding with new activities, culinary discoveries, craft beer gardens, arts and culture exhibits, sports attractions and more. This year, a second Four Seasons Hotel is opening -- a 61-storey skyscraper in the heart of Back Bay -- and on 23JUN will be the grand opening for the full-service, 27-storey resort and casino, Encore Boston Harbor, just north of the city. 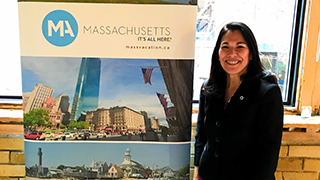 The networking event was as much a showcase of MA as it was a welcome of the new Executive Director of the Massachusetts Office of Travel & Tourism, Keiko Matsudo Orrall. Only 12 days into her new role, the Toronto affair was her first professional international event. Canadians are the top international visitors to Massachusetts, says Orrall, making up 30% of the market share. Approximately 700,000 Canadians visit the state each year. L-R: David Ginisi, Marketing & Communications Manager at Visit North Central Massachusetts; Vicki Saltzman, Director of Communications at the Clark Art Institute; Maria Speridakos, Director of International Public Relations at the Massachusetts Office of Travel & Tourism; Keiko Matsudo Orrall, Executive Director at the Massachusetts Office of Travel & Tourism; Hannah Choat, PR Account Manager at VoX International; Claire MacPherson, Marketing Communications Manager at the Plymouth County Convention & Visitors Bureau; Ann Marie Casey, Executive Director at the North of Boston Convention & Visitors Bureau; David O’Donnell, Senior Manager of Media Relations at Greater Boston Convention & Visitors Bureau.